TheNational Electrical Code(NEC) is a minimum electrical safety standard; its primary purpose is directed at protection of persons and property from electrical hazards. Hazards of electrical shock, electrocution, and fires are some of the more serious consequences of noncompliance with minimum rules for safety. The NEC is the most widely adopted code in the world and many jurisdictions adopt it in its entirety without exception or local amendments or supplements. 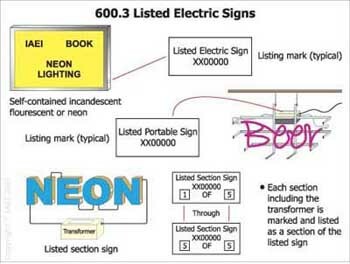 This article focuses on electrical signs and neon installations, what is included under the scope of Article 600, and some of the basics relative to the electrical inspection process. The authority having jurisdiction is responsible for approvals of electrical installations; and if theNECis adopted in its entirety without excluding Article 600, electrical signs and outline lighting, including neon lighting installations and systems, are included in that responsibility. Section 110.2 indicates that electrical conductors and equipment under the scope of theNECare only acceptable if approved. One can conclude that approval for electrical signs and outline lighting installations can be achieved by standing inspection. If an electrical sign never stands inspection, it obviously has no approval. Typical field-installed skeletal tubing neon sign installed in an indoor (dry) location required to be inspected for compliance with applicable rules of Part I and specifically Part II of Article 600. The NEC actually helps the process along by a requirement that all electric signs and outline lighting, including fixed, portable, or mobile, be listed and installed in conformance with that listing. These types of equipment and installations can also be approved by special permission, which, by definition, means approved in writing by the authority having jurisdiction. Some unique installations may not be listed, and approvals are often granted by special permission. The key is that there is an approval granted for the installation by the responsible entity. Most inspectors base their approvals on the use of listed equipment. With the requirements for listing in 600.3, the job of inspector is made a bit easier because a qualified electrical testing laboratory is involved in the conformance assessment process. Photo 3. Listed electric sign in the form of letters on a raceway with transformers and high voltage secondary in the metallic enclosure self-contained. Section 90.7 provides information that indicates listing and examinations for safety made under standard conditions can serve as a basis for approvals of specific equipment and items referred to by the Code. It is not intended that factory-installed internal wiring or construction of listed equipment (electric signs) be inspected at the time of installation other than to possibly detect damage or modifications. However, this listed equipment must meet the minimum requirements of any applicable safety electrical standard. 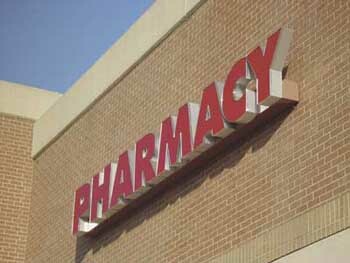 Electric signs fall under the scope of UL Standard 48 and are required by third party testing organizations to comply with the requirements in the standard. These types of equipment (electric signs and outline lighting) are suitable for installation in accordance with the installation rules of the NEC. This basically means that the internal wiring and components of listed electric signs evaluated to comply with UL 48 prior to installation in the field so they are not required to be inspected for compliance with Standard 48 at the time of installation. However, any field wiring or connection to such listed units is required to be inspected for compliance with the NEC. The listing covers the equipment only and not the field wiring. Field wiring must be inspected to verify such things as grounding and bonding connections, proper wiring methods, suitable and properly sized conductors, supports, and suitability of the location it is installed in, to name a few. A listed electrical sign includes a sign body, a fluorescent ballast, transformer or power supply, secondary wiring, and lamps or tubing. Generally this is a fairly elementary electrical inspection. It is, by comparison, similar to an inspection of an electrical luminaire (lighting fixture) installed in a building. 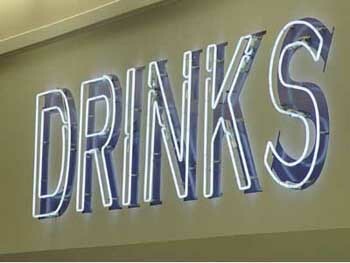 Listed electrical signs include listed assemblies that are incandescent, fluorescent, cold cathode, or neon. They generally are self-contained and require a field connection of a required minimum rated branch circuit. As specified in Section 90.4 of the NEC, it is not the responsibility of electrical inspectors to verify that the internal workings of a listed sign have met the minimum provisions in applicable safety standards. Sometimes listed electric signs are so large they have to be delivered to the installation site in two or more segments and assembled upon installation. The segments are put together to form an overall single listed sign. This is not a listed section sign, as it will include one “listed electric sign” label. The only field connections required for this sign are the connection of the sign circuit conductors and any grounding and bonding connections. These connections would be required to be verified by the electrical inspector. Another listed electrical sign falling under the scope of UL Standard 48 is a sign that is listed in sections. 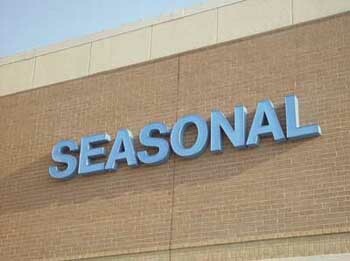 This listing covers each section of the overall sign as a complete entity made of several sections. Each one of the sections, including the transformer or power supply, must meet the requirements of UL 48. Each listed section is also required to be labeled or marked as a listed sign section (see figure 2). This includes any section(s) of the sign that include the transformer or power supply (see photo 4). 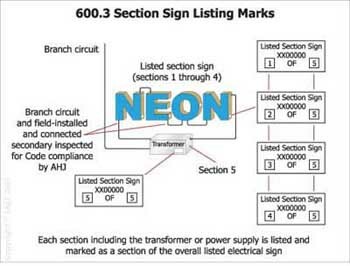 Each section would require a listing mark that identifies it as a section of the overall listed sign, including the transformer or power supply (see figure 4 and figure 5). 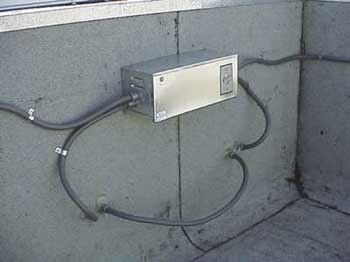 When these listed sections are field-installed and secondary wiring is connected from the transformer to the individual sections, field inspections are required. 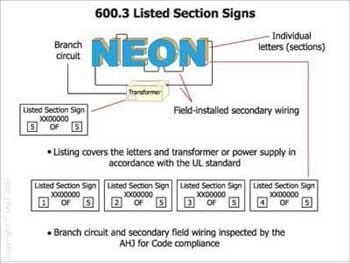 The listing of a section sign does not cover conformance assessment of the field-installed wiring and connected wiring. This must be inspected for compliance with any manufacturer’s installation directions in addition to with the NEC rules and any applicable local requirements. This is the responsibility of the electrical inspector. Additional information on section signs can be found in the UL General Information Directory in category (UXYT). Many inspectors hang their hats on the listing marks, but be careful; where the marks are listed section sign marks, field-installed secondary wiring must be verified for compliance also. Think of this inspection just the way a listed appliance is field wired. The inspection includes verification of the wiring and other connections to the equipment. The listing of the appliance does not cover the wiring in the building that supplies it. Article 600 is made up of roughly four pages of rules. Part II of the article includes the requirements for field-installed skeleton tubing, but also should be applied to all neon secondary circuits. Part II of Article 600 is where the minimum Code rules for high voltage secondary circuits, neon tubing, and electrode receptacles and enclosures are located. A hole in the 2002 Code has been identified in Article 600. A closer look at Part II and, specifically, Section 600.30 clearly indicates that this part of the article applies only to field-installed skeletal tubing. This is a major problem that requires a change to resolve what Part II is intended to apply to. There are many neon installations that include high voltage secondary field wiring that are beyond installed skeleton tubing installations. This part of the article should be applicable to all neon secondary wiring that is external to a sign body. This would include not only listed neon electric section signs, but also the other varieties of neon tubing and sign installations that are beyond just field-installed skeletal tubing. The definition of skeleton tubing is clearly an indication that this part of the article was intended for application to more types of neon secondary circuits and not limited to just secondary circuits for field-installed skeleton tubing. Clearly the scope of Article 600 (Section 600.1) would also indicate that Part II should be applicable to these types of installations. Part II should apply to all neon signs or applications with field-installed high voltage secondary circuits such as reverse pan channel neon signs, hanging neon signs with field-installed high voltage secondary circuits, as well as others. In actuality, it is being applied to many of these installations in practice in the field by those performing these inspections. Inspectors using special permission (as indicated in 600.3) to approve an installation need to be able to apply the provisions of Part II for high voltage neon secondary installations because this is the only location within the article to find the rules for tubing, high voltage secondary wiring, and electrode connections. Currently, under the 2002 NEC, Part II is applicable only to field-installed skeletal tubing. There have been several proposals to revise the NEC for the 2005 cycle. There also were proposals to clarify the applicability of Part II and resolve the conflict. The problem should be rectified in the 2005 NEC, but until that time there are the issues of rules that should apply to neon secondary circuits that literally cannot be applied as Article 600 is currently structured. Public comments are encouraged to help resolve the issue. The NEC provides an open consensus process that is open to all for proposals and comments to revise and improve the rules from cycle to cycle. The NEC is updated on a three-year cycle, which means a revision to correct this issue would not be included in the Code until the 2005 edition. There is a clear indication and need for interim action to clarify what is actually intended to be included under the requirements of Part II. Electrical safety depends on installations meeting minimum rules of applicable codes and standards. Electrical signs and outline lighting installations fall under the scope of theNEC, specifically, Article 600. Jurisdictions that adopt the NEC, including Article 600, have a responsibility for inspections and approvals of electrical signs and neon lighting installations. 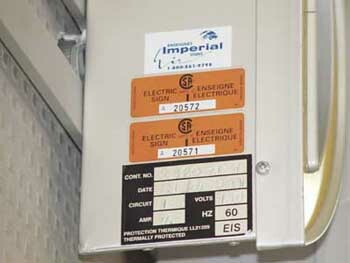 The use of listed electric signs is a general requirement of Article 600 found in 600.3 and is also a general requirement of the Code and serve as a basis for approvals by electrical inspectors. There are listed electric signs (self-contained signs) and listed electrical section signs. The sections of listed section signs are built to the same safety standard (UL 48) as listed self-contained signs. The key difference is that the listing of the electric sign sections applies only to each section. The wiring connected to the transformer primary and the field-installed high voltage secondary wiring is required to be inspected in the field for compliance with the manufacturer’s instructions as well as the installation rules of the NEC. The listing of listed section signs covers only the sections, not the field wiring. Listed equipment serves as a basis for the overall approval addressed in 110.2. The AHJ has the authority to approve and also reject installations whether listed or not. Generally, inspectors are looking for the listing as a basis for the approvals, but inspection of the connections and field wiring is needed. The listing agency cannot assure that the installation instructions for field wiring have been followed and that it meets the requirements of the installation Code. This is the electrical field inspector’s responsibility. Education and communication are two key elements in making effective electrical sign and neon inspections. Inspectors that are unfamiliar with neon, how it works, and how the Code applies to it, must bring their knowledge up to minimum levels to ensure quality inspections of these installations. There are resources available for this type of education and training. The new IAEI book, Neon Lighting, is sure to assist many as a valuable resource in this area. If unsure about any electrical installation or system and how the rules of the Code apply, it never hurts to ask in this business.